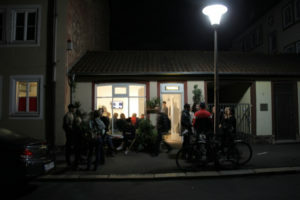 I was selected as one of 9 artists or artists teams to take part in residency and festival in Hildesheim, Germany. The residency takes place from April 8 to May 27 and ends with a festival Transeuropa Fluid where our works will be presented. It’s a unique and very beneficial form of commission , that I feel honored to be selected to. I really needed to have time to develop new ideas and I was provided all I need in the lovely city of Hildesheim. 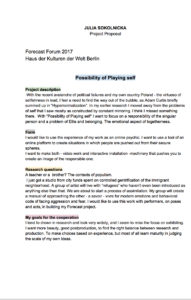 The project YOU MUST APPOLOGIZE, that I worked on in Hildesheim is a continuation of „Simple gestures” my research on social choreographies that I have launched with my last year’s April 2016 HKW in Berlin Forecast Forum under the mentorship of Bjorn Melhus. 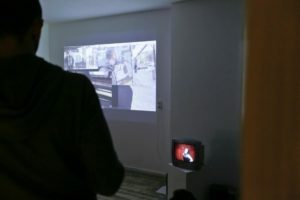 I later continued the research through practice („Simple gestures” at Feiertag Gallery Kassel (DE) with Marcin Kamiński , where we worked with video , sound and physical intervention, and later in Cracow (PL), as a part of my weekend takeover in Gallery Pamoja Goods. 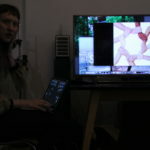 Now I have finally gotten a chance to work with re-ennactement and performative experiments with the local amateur performers and members of local communities. 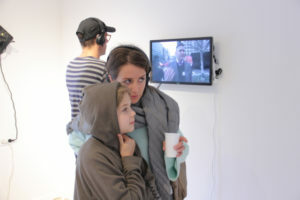 „You must apologize”, essay film 30’min with sound work of Mariia Kashyna. I have been invited to a truly great festival which title and list of topics was exactly in the thread of the research I’m doing for my project DIGITAL NOMADS. It was very exciting to go to Riga and listen to all the key speakers, i must say that the format of conference/exhibition was exactly my thing. I hope to return to this amazing festival and definitely I will return to Riga (loved it!). 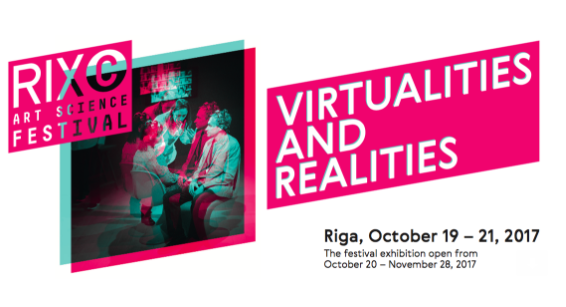 VIRTUALITIES AND REALITIES is the theme of this year’s RIXC Art Science festival in Riga, Latvia, that aims to establish a space for artistic interventions and conversations about the complex implications of immersive technologies. 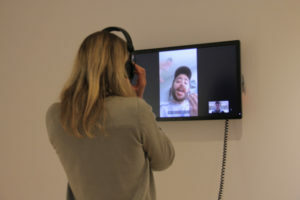 RIXC Festival is internationally renowned gathering for artists and scholars working at the intersection of arts, digital humanities and science. This year’s festival programme features Public Keynotes, the 2nd Open Fields Conference, Exhibitions, Performances and AR/VR Showcases. The main festival events will take place from October 19–21, 2017, in some of Riga’s most visible art venues – the Conference will take place in the Art Academy of Latvia, and the Latvian National Museum of Art, while the exhibitions – in kim? 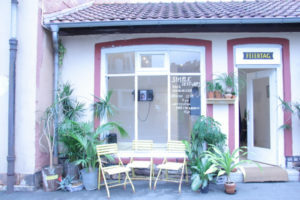 Contemporary Art Centre and RIXC Gallery spaces. 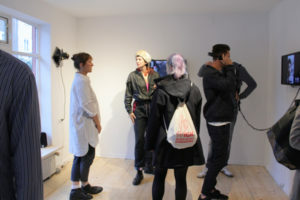 The main festival exhibition will feature the most innovative artworks that experiment with augmented and virtual reality, create immersive environments, and explore complex relations between the “virtualities” and “realities” of our post-media society with its networked communities and migrating cultures. VIRTUALITIES AND REALITIES exhibition artists: Marc LEE (Switzerland), Jacques PERCONTE (France), Juuke SCHOORL (the Netherlands), Brenna MURPHY (USA), Hans BREDER (USA), Clement VALLA (USA), Matteo ZAMAGNI (United Kingdom), Zane ZELMENE (Latvia), The Swan Collective (Germany), Annie BERMAN (USA), Felipe CUCKER and Hector RODRIGUEZ (Hong Kong), Gunta DOMBROVSKA (Latvia), Martin John CALLANAN (United Kingdom), Nina FISCHER and Maroan EL SANI (Germany), Santa FRANCE (Latvia), Greta HAUER (United Kingdom), Martin HESSELMEIER and Andreas MUXEL (Germany), Raphael KIM (United Kingdom), Michal KINDERNAY (Czech Republic), Christopher MANZIONE and Seth CLUETT (USA), Andrew MCWILLIAMS (USA), Melodie MOUSSET and Naem BARON (Switzerland), Martin REICHE (Germany), Hanns Holger RUTZ (Austria), Julia SOKOLNICKA (Poland/the Netherlands), Danielle ZORBAS (Australia). It happens so that both Digital Nomads and Simple gestures, my most actual and biggest projects, are both touching upon utopias. Utopia of solidarity, togetherness and multicultural communication. I research communities. 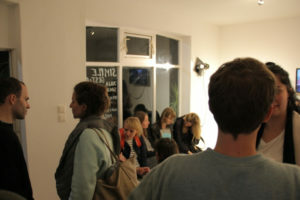 Therefore the invitation from Pamoja to present my work in their shop/gallery in Cracow, was a real treat. I hope it’s just the beginning. 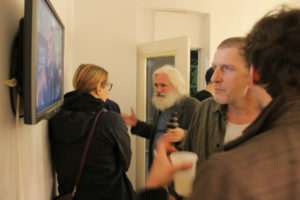 Here are some pictures from the event curated by Pola Tyszowiecka and Bartosz Przybył-Ołowski. 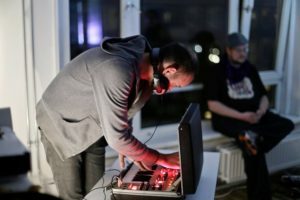 Here is a short program and documentation of that amazing weekend takeover. Zapraszamy na weekend zanimowany przez artystkę Julię Sokolnicką w Pamoja Goods. Zaprezentowane zostaną trzy projekty realizowane w Nowym Jorku, Amsterdamie i Berlinie, których tematyką jest budowanie podstawowych więzi społecznych i konfrontacja w przestrzeni publicznej, oraz badanie cienkiej linii między realną a cyfrową przestrzenią spotkania. 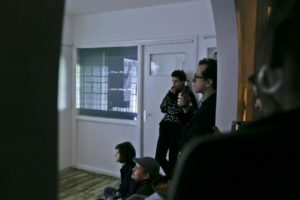 DIGITAL NOMADS to film dokumentalny edytowany na żywo, na podobieństwo muzyki miksowanej przez didżeja, pozostającego w rzeczywistym i symetrycznym kontakcie z publicznością. 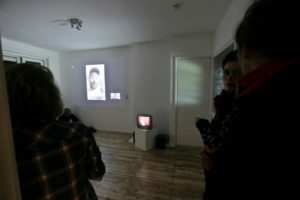 Składają się na niego portrety aktywistów kulturalnych i impresje dotyczące wagi rzeczywistych spotkań, struktury plemiennej klubu i tego czym jest kontrkultura. Autorka próbując odpowiedzieć na pytania o esencję budowania wspólnoty we współczesnych, wielokulturowych metropoliach, powiększa tym samym archiwum projektu, rzeźbiąc i zmieniając film przy każdym kolejnym pokazie. 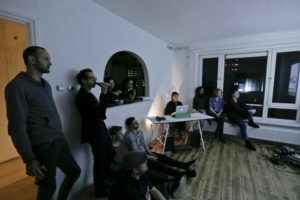 Każdy miks ” Digital Nomads” jest inny. Zdjęcia powstawały do tej pory w Berlinie, Amsterdamie i Nowym Jorku. Jak przenieść bezpretensjonalność i energię bezpiecznej przestrzeni nocnego klubu w przestrzeń życia dziennego? To pytanie które stało się podwaliną działalności międzynarodowego kolektywu Physical People, którego częścią jest Julia Sokolnicka. 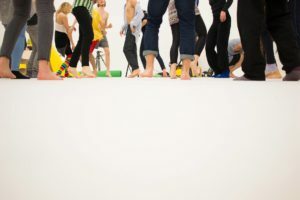 Physical People to grupa performerów i artystów wizualnych, specjalizująca się w interwencjach w przestrzeni instytucji, galerii i przestrzeni miejskiej. Zapraszamy serdecznie. Prosimy przygotować się na dużo ruchu i głośną muzykę. Poproszeni zostaną państwo o zdjęcie obuwia. Na miejscu będzie woda. 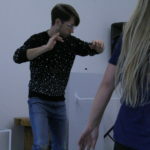 Proste Gesty (Simple Gestures) to tytuł projektu badawczego, który koncentruje się na choreografii konfrontacji i manierach w wielokulturowych społeczeństwach. Artystka usiłuje stworzyć wizualny podręcznik skodyfikowanych gestów, nawiązując do nieco już zdezaktualizowanej tradycji savoir vivre’u. W ramach warsztatów, Julia Sokolnicka przedstawi proces pracy nad wizualnym tradycjami stosowania skodyfikowanych gestów w przestrzeni publicznej. 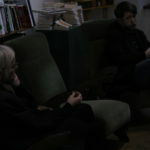 W swoich instalacjach audiowizualnych i pracy w teatrze artystka wielokrotnie odwoływała się do projektu, zanurzając się w badania nad dramaturgią spotkania i pierwszego kontaktu oraz emocjonalnego języka zdjęć ze stocku. Warsztaty będą spotkaniem wokół znanych referencji i wymianą doświadczeń i poglądów między zebranymi, zakończoną próbą zainscenizowania gestów w których wyrośli uczestnicy, lub abstrakcyjnych “gestów przyszłości” które spróbujemy wspólnie stworzyć. Czas trwania warsztatów 3 godziny. Warsztaty odbędą się w języku Polskim, ale istnieje możliwość tłumaczenia na język angielski. 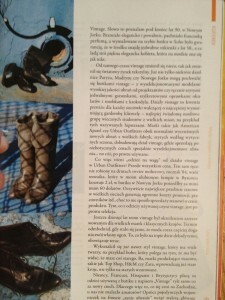 Zapraszamy uczestników z różnych kręgów kulturowych, w każdym wieku. 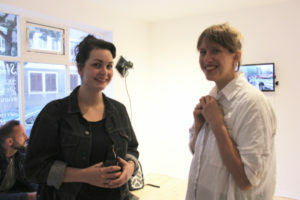 Pamoja Goods invites Julia Sokolnicka – polish filmmaker and researcher based in Amsterdam for a weekend take over. We will present three projects elaborating on social schemes and bonding in the morphed edge of digital and real spaces. 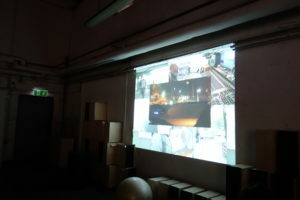 With the footage filmed in Amsterdam, New York City and Berlin. 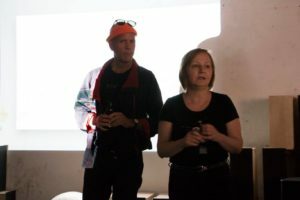 DIGITAL NOMADS is an archive of documentary portraits and impressions on cultural movements in the large, international metropolis. The film is mixed live, like a DJ would mix music. The camera follows underground culture in New York, Amsterdam and Berlin, following questions of how will the future communities look like and what are the challenges and peculiarities of authentic bonding in the modern western economy. 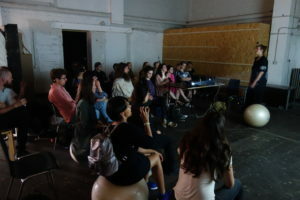 The film emphasizes on importance of dialogue and conversation as a tool of intellectual exploration and the dichotomy of the real space of social interactions and the space of technology. The project is ongoing and it has been launched in Eye Film Museum Amsterdam in June 2016. 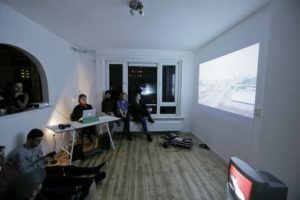 It has since been presented at several exhibitions in Netherlands and in KMMN Interim space in Kassel in the context of Documenta 14. 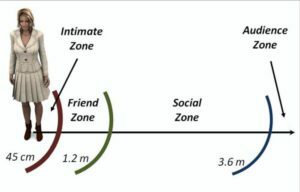 How to convey the safe space of night life into the day life? 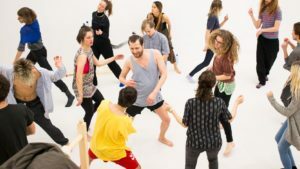 That question is one of many that funded Physical people, Amsterdam based collective in which performers from Poland, Netherlands, Taiwan and Argentina, intervene within institutional, art and public spaces with movement and loud music. Come sweat with us. There will be water, and loud music. 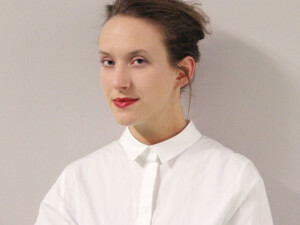 JULIA SOKOLNICKA – born in Warsaw in 1983 is an experimental and documentary filmmaker. 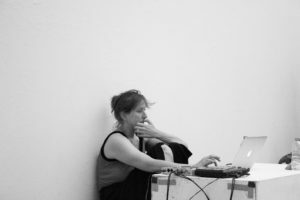 Her current projects “Digital Nomads” and “Simple Gestures”combine performance art and cinema through formal experiments and theoretical exploration. Both focus on community bonding and identity of the global youth in the late capitalis, and address the utopias of solidarity and problems of multicultural societies. 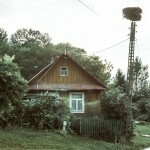 She worked as a journalist and photographer, depicting her hometown-Warsaw in the era of it’s rapid development, focusing on cultural NGO’s and communitarian growth of the city. 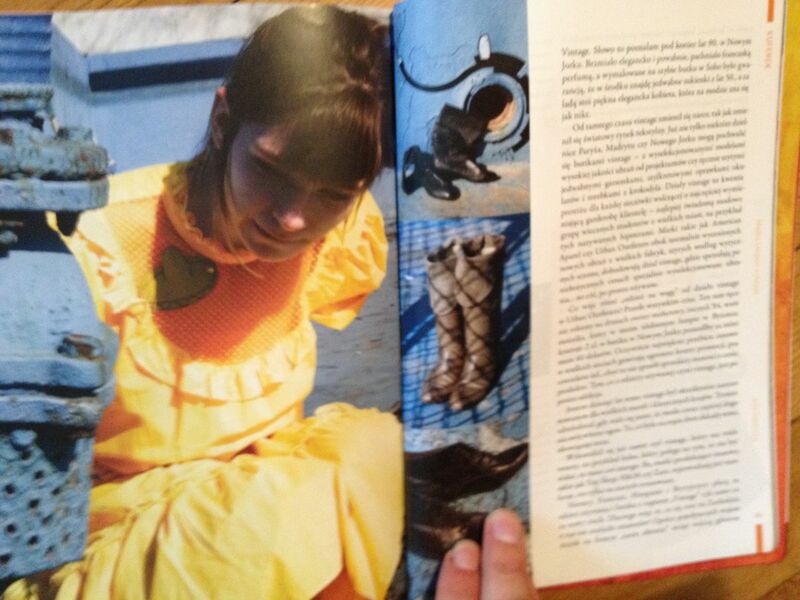 For many years she was organising events around ethical fashion and conscious consumerism. Her diverse body of work ranges from costume design, visual concepts for theatre, experimental filmmaking to music and dance videos. She studied Philosophy, Film Directing and graduated from Master of Film with an artistic research degree at Nederlandse Filmacademie in Amsterdam. 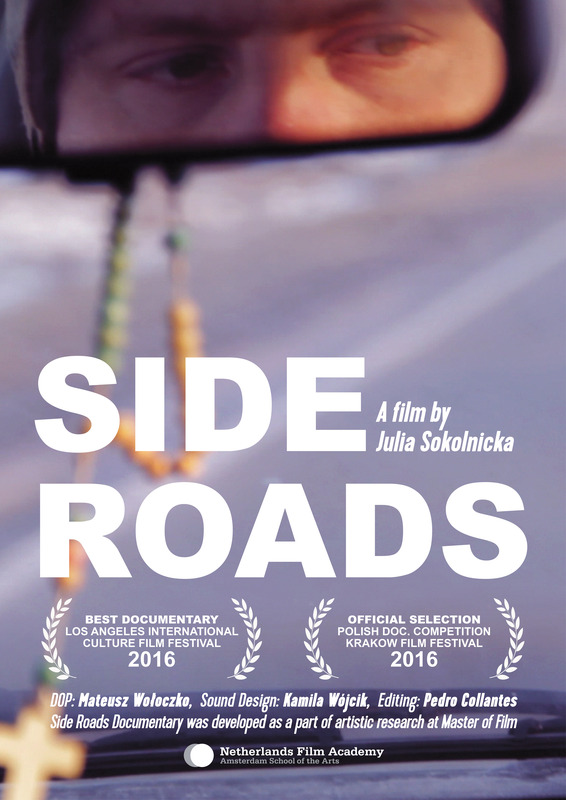 Her short documentary film “Side Roads” has received a number of international awards and a distribution in Polish cultural channels such as TVP Kultura and Ninateka. With great pleasure we invite you to “Simple gestures” – a three day video and sound installation by a polish artist Julia Sokolnicka. 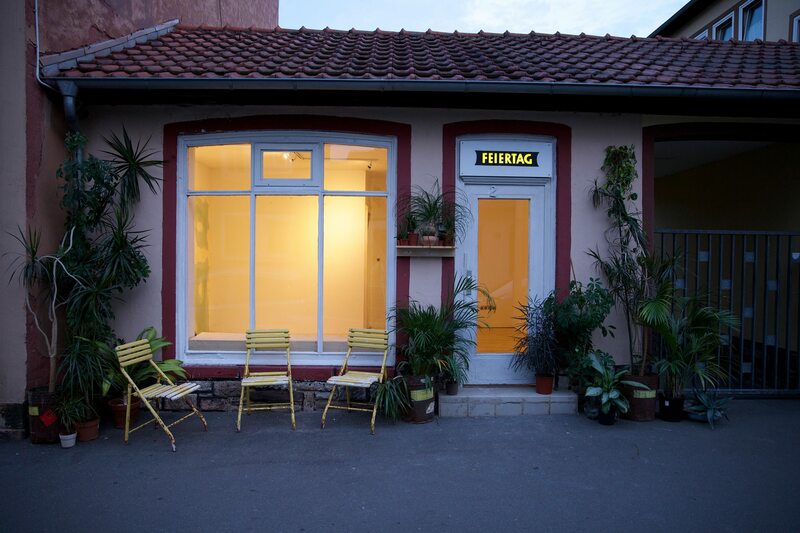 Friday 11.08 – 19.00 opening Julia Sokolnicka. Sunday 13.08 – gallery open for viewing. 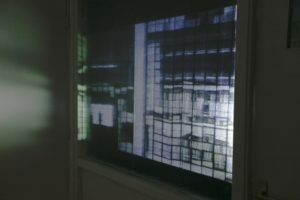 In her work Sokolnicka focuses on the notion of conversation as an ultimate source of knowledge, treating the gallery space as a multidimensional field for a film narrative. 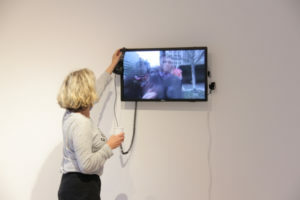 In her practice she combines documentary portrait, performance and found footage to create an open archive, inviting spectators to add into a narrative. 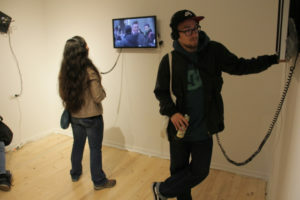 “Simple gestures” elaborates on the soundscape as a modus of the gesture in the contemporary political discourse. 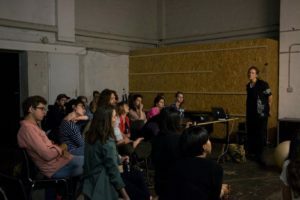 Coming from the video-performance-lecture made in collaboration with Nicholas Bazzano – New York City based artist and Tisch School of the Arts scholar, she analises the gesture as a tool of dialogue as well as a symbolic manifestation of power. 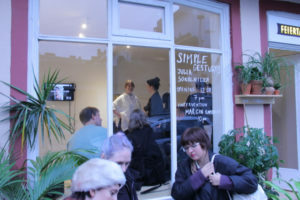 “Simple gestures” combines her earlier research of techno as a most recent counterculture, serving the body oppressed by the mechanics of the work politics. 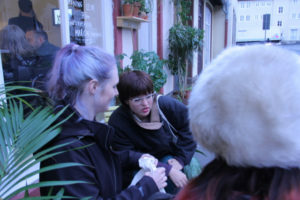 Her performative work, such as with Physical People collective, translates specific body politics into the dynamics of pleasure. 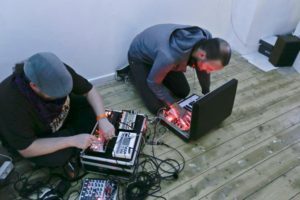 Techno, which is sourced in the same mechanical sounds, as the sonic poetics of the industrial era, drives her new research question of the foundation of modern emotional education, and locates soundscape of the city as it’s main aspect. 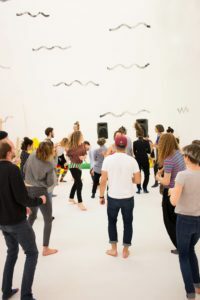 The SIMPLE GESTURES show is a bridge between those two researches – trying to locate the sound and movement in a different context than purely power play, and emphasizing its function as a tool of communication. Julia Sokolnicka is a Polish artist based in Amsterdam and Warsaw. She comes from a film industry background and works internationally both in collaborations and on her solo projects, that are usually research based. Operating mostly with documentary language and experimental narratives, she finds her way through to different media in the field of film. 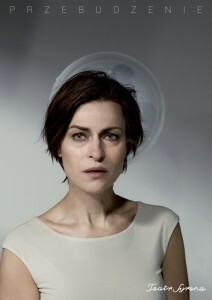 She works with video art, theatre and classic cinema. 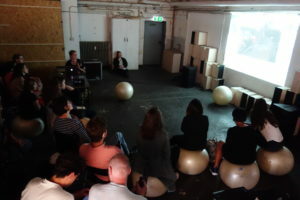 Her ongoing live mixed documentary project “Digital Nomads” was presented in Kassel on July 3rd in the context of KMMN. 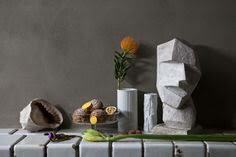 Marcin Kaminski is a student of Fine Arts Department at Gerrit Rietveld Academy in Amsterdam. 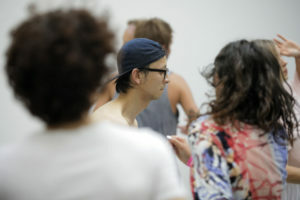 His works are interdisciplinary, he is using different media as video, installation performance and life act. Marcin’s latests interests are focus on new values in modern society, he explore also themes of compatibility and inhabitness. 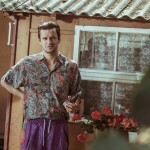 Marcin lives and works in Amsterdam. 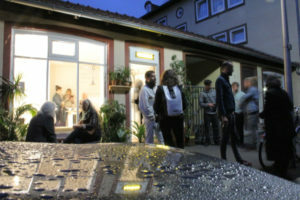 The works presented formed a four channel audio/video installation with video’s closing the space and sound installation recorded on spot in Kassel’s multilingual busy area filling the space with distorted sounds from the side of the window. 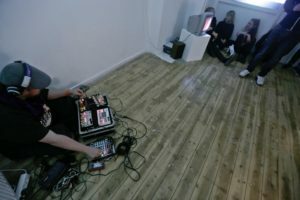 The idea of the exhibition was that the video and sound work would be complimentary to the performances by Marcin Kamiński. 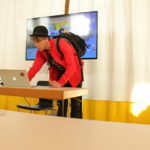 Thanks to the generous support of Instytut Adama Mickiewicza – Program Kultura Polska na Świecie – I was able to attend a presentation in KMMN with my ogoing project Digital nomads. Digital Nomads is a documentary film that is edited live in the cinema. The film is mixed live by the director presenting it, like a DJ would mix music. Digital Nomads is an archive of documentary portraits and impressions on cultural movements in the large, international metropolias. 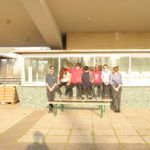 The director observes and interviews the new types of communities bonding in the english speaking generations brought up on internet. The narrative changes each time the project is presented, and as the archive grows the research enriches in new topics and locations. 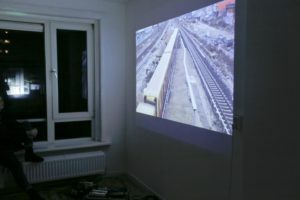 The original research project „Reality and Realness” that inspired the film was elaborating on digital intimacy and the use of cameraphones and content produced by the characters themselves in the documentary cinema. The camera follows underground culture in New York, Amsterdam and Berlin. 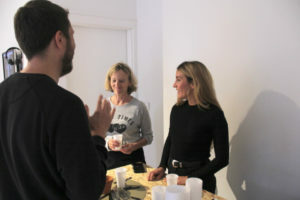 Filmmaker and Philosopher Julia Sokolnicka tries to answer questions of how will the future communities look like and what are the challenges and peculiarities of authentic bonding in the modern western economy. 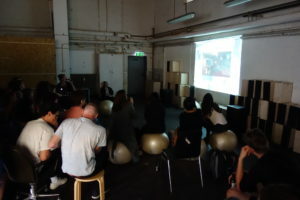 The film emphasizes on importance of dialogue and conversation as a tool of intellectual exploration and the dichotomy of the real space of social interactions and the space of technology. The project is ongoing and will soon move to South-East Asia researching on alleged Neo-colonial communities of western creatives living and working in Cambodia, Thailand and Vietnam, and the new Types of bonding through technology in China. 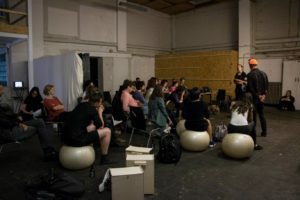 With KMMN, the Kunsthochschule Kassel/School of Art and Design Kassel offers a student run participative platform for discussing, presenting and developing ideas and projects that directly touch upon the issues of learning, teaching, making and exhibiting art. 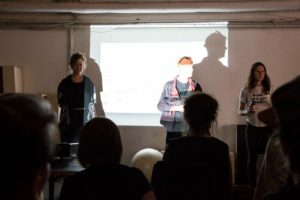 KMMN can be read as ‘common’, as it provides a flexible structure for meeting and staging exhibitions, performances, workshops, lectures, talks or screenings within the rooms of the ‘Interim’ near the Kassel central station. 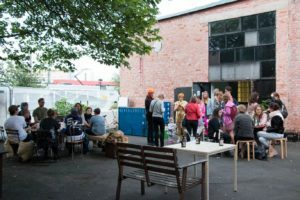 KMMN stands also for ‘community’ – we provide information, and have a bar and a kitchen to create a convivial space for everyone. KMMN is, as well, derived from the German ‘Kommen’ (coming, arriving), an open invitation for individual students or groups to participate. We host projects from Athens, Geneva, Griffith, Zürich, and many other places so far, and are very interested to hear from anyone else who would like to contribute to the programme during the 100 days of documenta 14 in the summer of 2017. 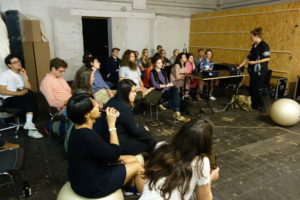 Um diese internationalen und nationalen Begegnungen möglich zu machen, werden wir das INTERIM für die Laufzeit der documenta 14 in eine offene Kommunikationsplattform der Kunsthochschule Kassel verwandeln. Der Ort wird KMMN heißen, eine offene und assoziationsreiche Formulierung, die das An-KMMN, und das Will-KMMN sein assoziiert, aber auch an das englische Wort COMMON (gemein, öffentlich, weit verbreitet) erinnert. Studierenden und Lehrende haben dort die Möglichkeit Ideen rund um das Lernen, Lehren und Ausstellen zu diskutieren, vorzustellen und zu entwickeln. Es gibt bereits Anfragen von auswärtigen Kunsthochschulen die Interesse haben, im Rahmen der d14 mit der Kunsthochschule zu kooperieren. 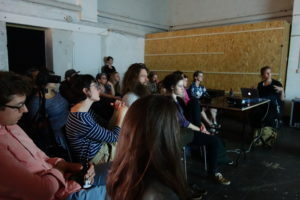 KMMN stellt allen Gästen eine flexible räumliche Struktur zur Verfügung, um sich in den Räumen des INTERIM am Hauptbahnhof zu treffen und Ausstellungen, Workshops oder Screenings durchzuführen. 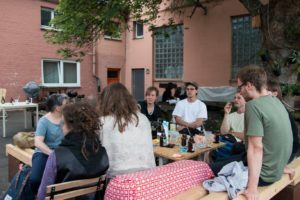 Die Zielsetzung des Projekts KMMN ist, einen temporären Ort der Kommunikation und des Austauschs zu etablieren und zur Verfügung zu stellen, der Lehrenden und Studierenden aus allen Studiengängen der Kunsthochschule Kassel die Chance gibt, ein nachhaltiges internationales Netzwerk im Kontext der d14 aktiv zu gestalten. 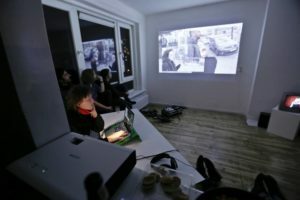 Zu Gast sind Projekte aus Athen, Zürich, Griffith und vielen anderen Orten, und wir freuen uns, von Anderen zu hören, die während der 100 Tage der documenta 14 im Sommer 2017 am KMMN Programm teilhaben möchten. In the end of June 2017 I was a part of intensive collaboration with a theatre director Szymon Adamczak in a piece presented at his Master of theatre studies in DAS Theatre in Amsterdam. 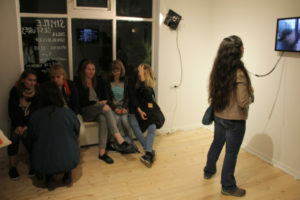 The Piece called „We are not watching the past yet” was loosely elaborating on the dynamics of the feminine figures, linked to the recent feminist crisis in Poland over the complete abortion ban implemented by the Polish government, and a XIX th century story „The yellow wallpaper” That Adamczak has linked to a personal story of his mother. The piece was staged in the space divided in two, and my role was first to be producing video content for the staging, It ended up to be a divided spectacle played simoultanousely by a couple of performers (me and Szymon Adamczak) – role playing between feminine and masculine, between visible and imagined, between whats to be seen and what’s socially implemented. In „We are not watching the past yet” I was performing lie on stage, that seems to be an important experience for my latest works that combine live performances and video work understood as a form of a lecture or knowledge reference – in this case w visual reference. 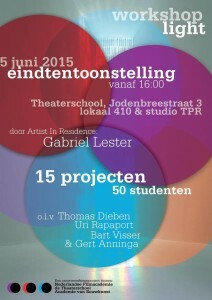 In „We are not watching the past yet” I was also an auteur of the part of the text for the play and improvising live. The visual material for „We are not watching the past yet” was inspired by my recent research on the visual constitution of social expectations through editing google search content and stock photos into edited, emotionally schemed visualizations. The exhibition „Simple gestures” That followed in Kassel is an outcome of that experience. 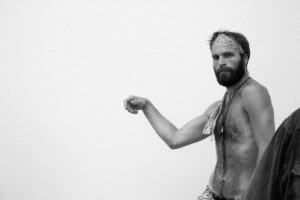 I am a member of a performative intervention group called Physical People. 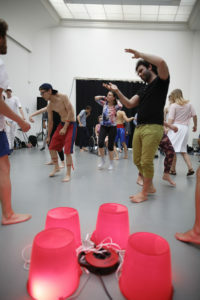 Funded in Amsterdam in 2016, Physical People is a collective which organizes interventions with an ephemeral character. 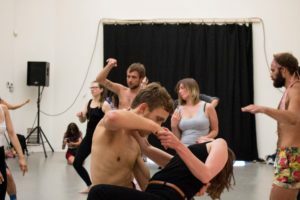 Driven by movement, energy and music our aim is to create a space for people to get out of themselves by provoking spontaneous choreographies. 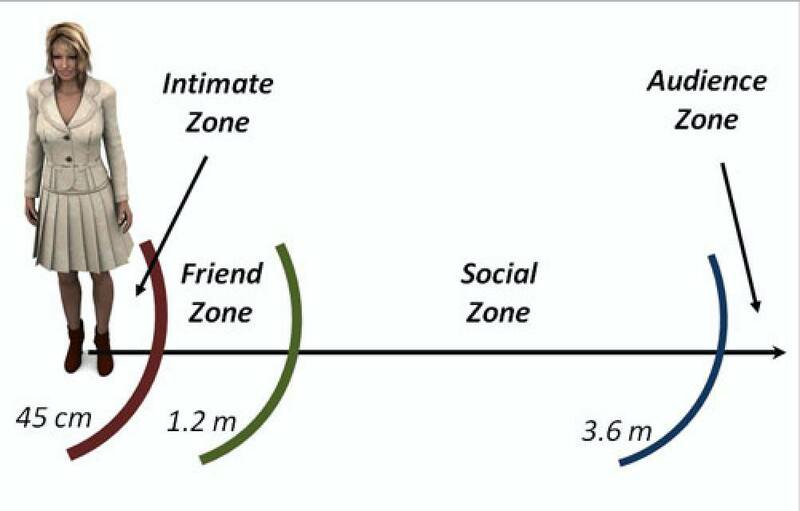 Physical People performances interact with the given spaces and social context. 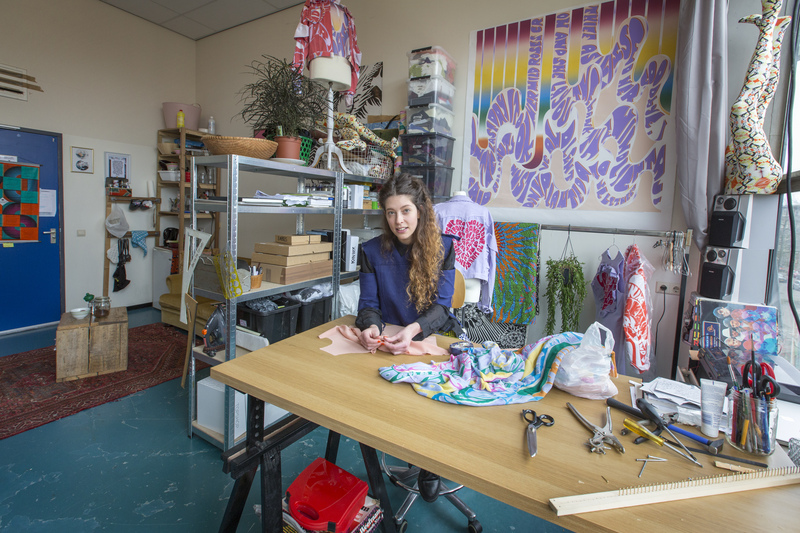 In a collaboration with photographer Vera Duivenvoorden and graphic designer Paul Stümpel we created an ON AIRs project, that aims to document the Art Residencies, starting with the one that we met at – WOW art residency in Amsterdam. Our goal is to spread the concept of observing the peculiarities of living /working spaces as such into different institutions. We aim on grasping the temporality and intense creative atmosphere that is an outcome of it, framed into the specific space. AIRs. Who are they? Or: who are we, because ON AIRS is a project about us, made by us. AIR is short for Artist in Residence. 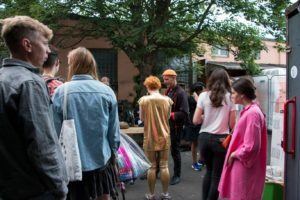 A residency is a formal way of giving artists temporary housing or work-space to help them develop projects. The residency can be in the form of a scholarship, but it can take other shapes too. 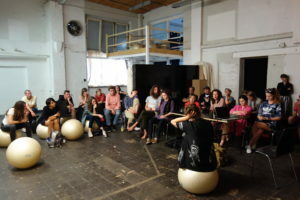 Increasingly, residencies around the world are paid for by the artists themselves – both in art schools and institutions providing the artist with education, curatorial support or studio space, and in housing/studio facilities allowing artists to re-locate to inspiring spaces or hubs for networking and professional development. As fast as the art world grows, the earth shrinks and big cities, such as Amsterdam, are undergoing rapid metamorphoses. A city’s culture is closely connected to its artists – some would say the barometer and critical force of change. 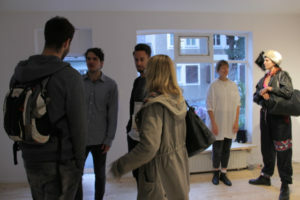 Gentrification and the residential aspect of art practice are inextricably linked. 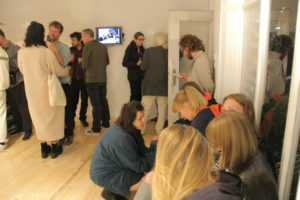 ON AIRS focuses on different aspects of temporality of the residency. At WOW we interviewed our neighbours and friends, as this is where we met and worked together. WOW is special for many reasons. Founded together with the city council as a ‘Broedplaats’ (art factory), it also houses a hostel, the proceeds of which support the structure as a whole. 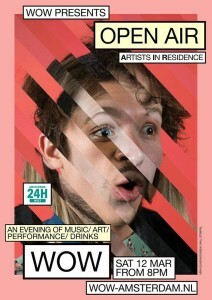 WOW is also one of the largest residences, hosting around 50 artists of different ages, nationalities and career goals. 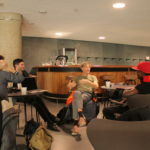 What interested us in ON AIRS is how we are all very different but work within the same parameters: two years at WOW, in identical spaces in a modernist building, the former polytechnic. Especially the spaces were inspiring: it became clear that these four walls could be filled with entirely different energies and artistic personalities, while the time given and the goals were similar for everyone. To evolve, to grow, to establish roots, to break through to the market, but stay creative and true to ourselves. 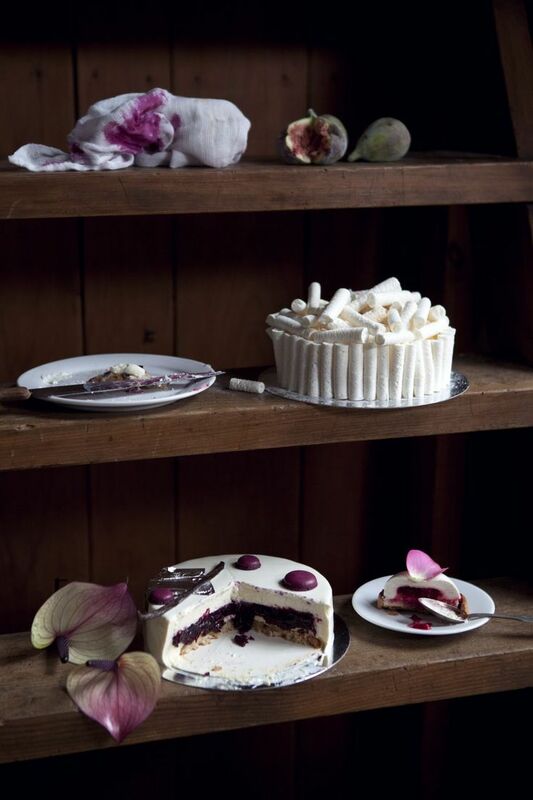 Enjoy ON AIRS – the very private studio visits, capturing that one moment in time when each of us was an AIR. 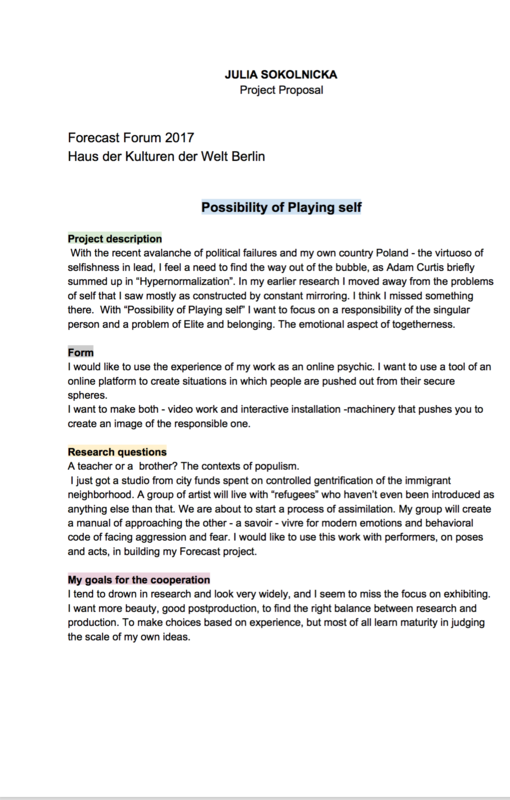 My Project „Playing the Self” was selected for Forecast Forum in Haus der Kulturen der Welt in Berlin. 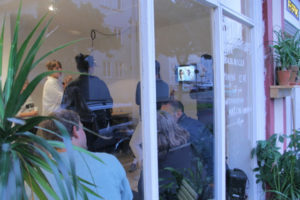 Together with an amazing group selected by Bjørn Melhus we worked on projects that were moving image based, but what I found extremely interesting is that all of us video artists were in fact producing knowledge based on specific interdisciplinary researches – from philosophy and aesthetics, into performance art and social entrepreneurship. Video is just the coolest. Bjørn Melhus group at Forecast Forum : Joshua Kagimu (UG), Liliana Piskorska (PL), Anna Sobczak (DE/PL), Julia Sokolnicka (PL), Beny Wagner (DE/US/IL) and Hui Ye (CN) worked together between March 31 to April 1, 2017. With the recent avalanche of political failures and my own country Poland – the virtuoso of selfishness in lead, I feel a need to find the way out of the bubble, as Adam Curtis briefly summed up in “Hypernormalization”. In my earlier research I moved away from the problems of self that I saw mostly as constructed by constant mirroring. I think I missed something there. With “Possibility of Playing self” I want to focus on a responsibility of the singular person and a problem of Elite and belonging. The emotional aspect of togetherness. I would like to use the experience of my work as an online psychic. 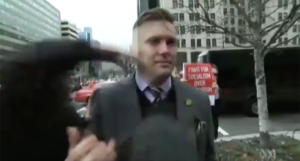 I want to use a tool of an online platform to create situations in which people are pushed out from their secure spheres. 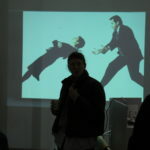 I want to make both – video work and interactive installation -machinery that pushes you to create an image of the responsible one. A teacher or a brother? The contexts of populism. neighborhood. 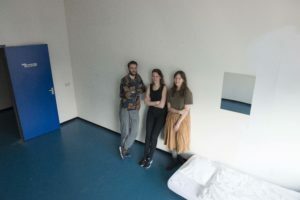 A group of artist will live with “refugees” who haven’t even been introduced as anything else than that. We are about to start a process of assimilation. My group will create a manual of approaching the other – a savoir – vivre for modern emotions and behavioral code of facing aggression and fear. 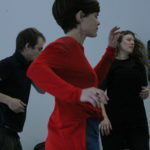 I would like to use this work with performers, on poses and acts, in building my Forecast project. I tend to drown in research and look very widely, and I seem to miss the focus on exhibiting. 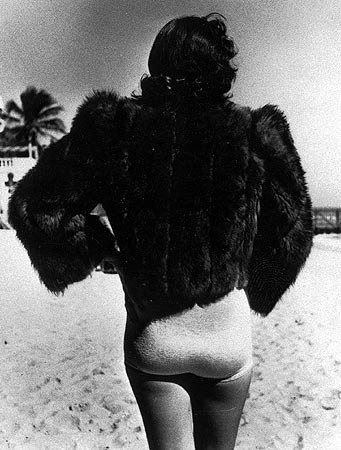 I want more beauty, good postproduction, to find the right balance between research and production. To make choices based on experience, but most of all learn maturity in judging the scale of my own ideas. 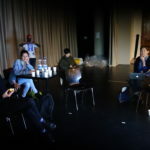 I had an honor to be invited and selected to take part in an intense workshop for international young producers and directors. I learned how complicated and expensive filmmaking is, but after two weeks of minor discouragement I’m back on track, stronger and so much wiser! Thank you Creative Europe, New Horizons festival, and thanks to all the wonderful participants and teachers I had a chance to meet. 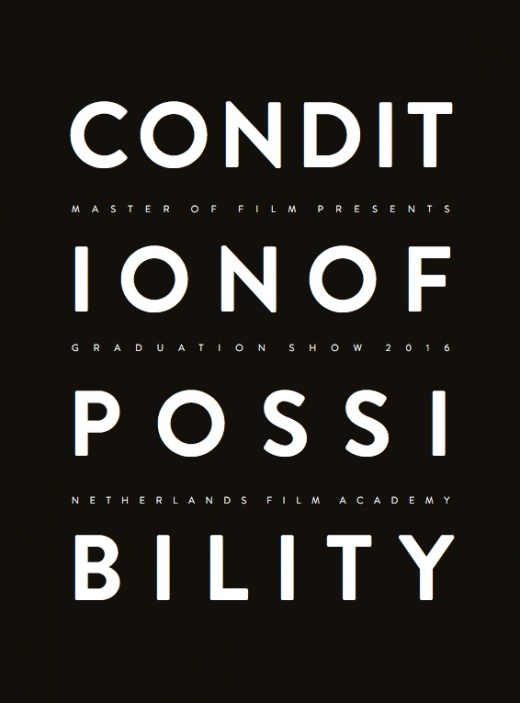 On June 24-29 2016, the Condition of Possibility exhibition took place in Eye Institute in Amsterdam. 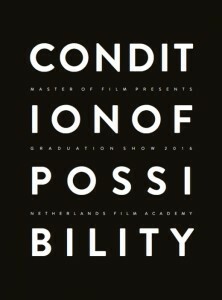 It was a graduation show of my Master of Film artistic research MA program, that brought me to Amsterdam and took two exciting years of my life. It was also the most beneficial investment I ever made and and excellent school of life. I grew artistically in many directions, and finally let myself explore the always awaiting interests. 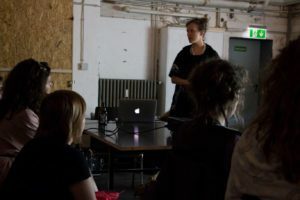 I graduated with two works – Side Roads finished in October 2015 from the materials I brought to Amsterdam from Poland, and a new project that I will continue developing – Digital Nomads. 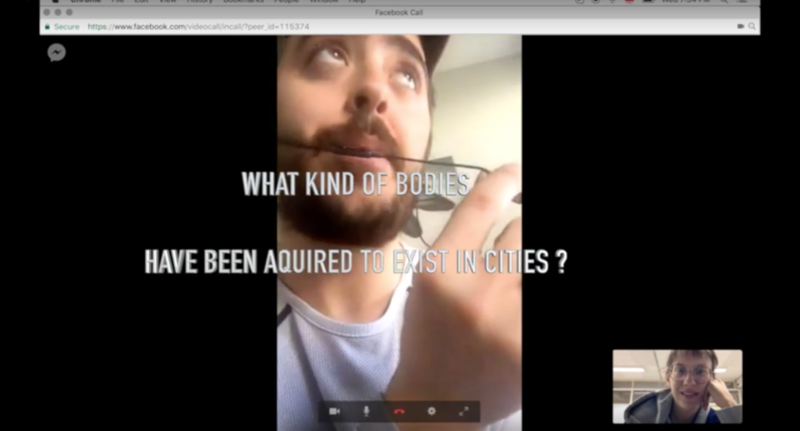 “Digital Nomads – Live Mixed Film” (2016, 45 min ) explores an inclusive method of conversation, that she developed and live performance in the cinema in order to establish contact between the audience and portrayed characters. The protagonists are representatives of a modern international, nomadic, precarious counterculture gathered around the techno music scene. 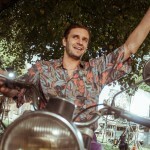 The Mix includes portraits of international metropolitan youth – creatives, cultural activists and members of DYI music scenes in New York, Berlin, and Amsterdam. 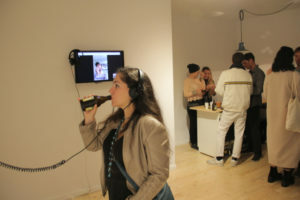 It also explores one of her main focuses on communication technologies as space. 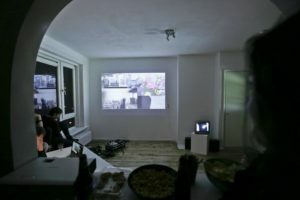 She positions technology as equal to the “real space” and analyses its relationship with political set-up of of “real space” such us Real Estate, Education and Employment markets and the strategies of the gentrification. 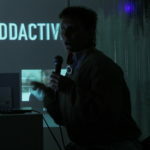 The live mixed film also posits the documentary director as an editor of an inclusive archive of personalities. “Digital Nomads” is an ongoing project. Her next planned exploration is the techno underground in Cairo. Framed and finished during the Master’s program from an archive of conversations with drivers on Polish roads. In this poetic road trip through the rural, winter landscape, the intimate portraits of drivers are juxtaposed with the grotesque architecture. 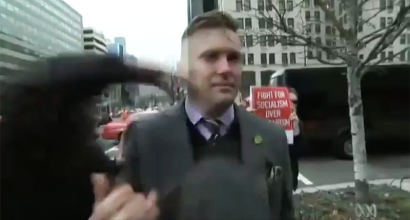 Still frames capture absurd objects and people frozen in reflection over what’s really important. 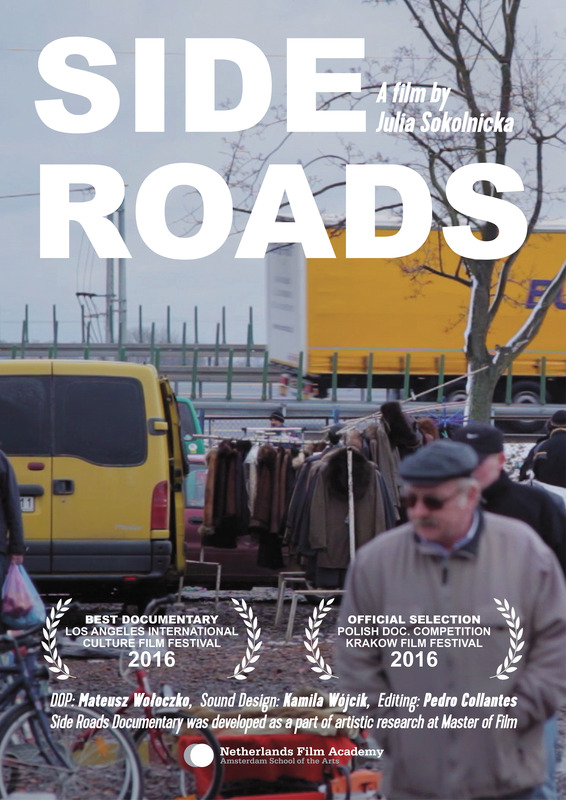 “Side Roads” was awarded Best Documentary at International Culture Film Festival in Los Angeles, and is now touring Major Polish Festivals. Among many wonderful experiences there was one extraordinary benefit that will walk with me from now on. The power of the group. 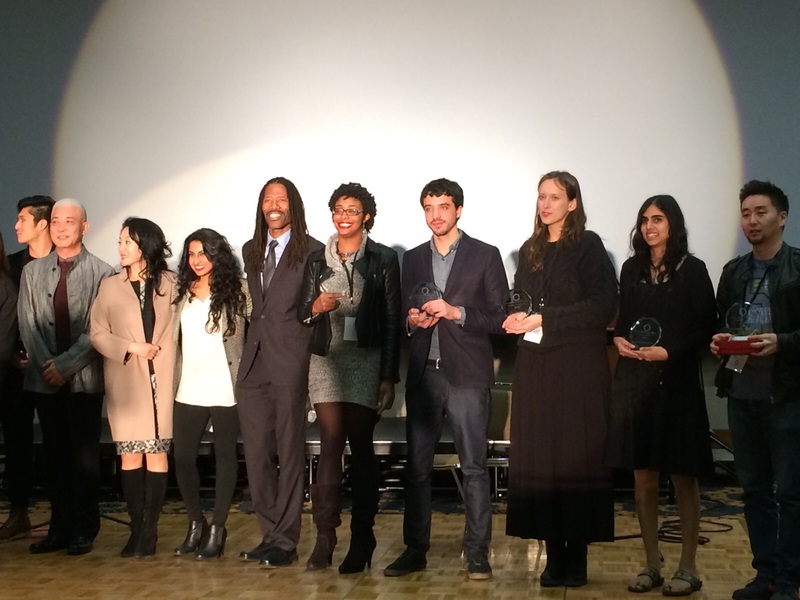 Here is the list of my amazing collegues, whose paths will cross mine from now on again and again, I am sure of that. I would also like to point out names of Mieke Biernink – the headmaster and the creator of this experimental program, Eyal Sivan, the mastermind behind it’s experimental formula atatched to the idea of being a researcher and archiver – the Fleneur, as we learned at the beginning, and my wonderful mentor Albert Ellings who was my guide and careful spectator of complicated travels of my mind. Those two selections and also upcoming graduation were a good occasion to complete promo materials for the film. 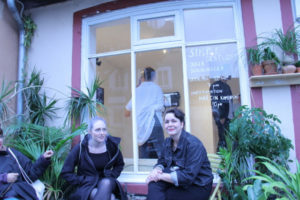 The Bookstore Project is an amazing network of art spaces and community of cultural animators located in Amsterdam West. 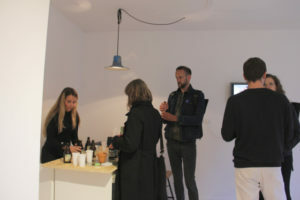 They have a great and ambitious program and it’s a great honor to be invited to their gallery space. Bookstore Space is taking part of 24h West Amsterdam and invites Julia Sokolnicka. 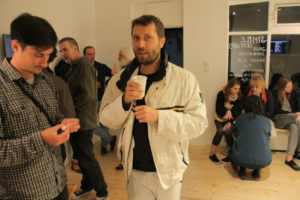 Artist will presenting two artworks. 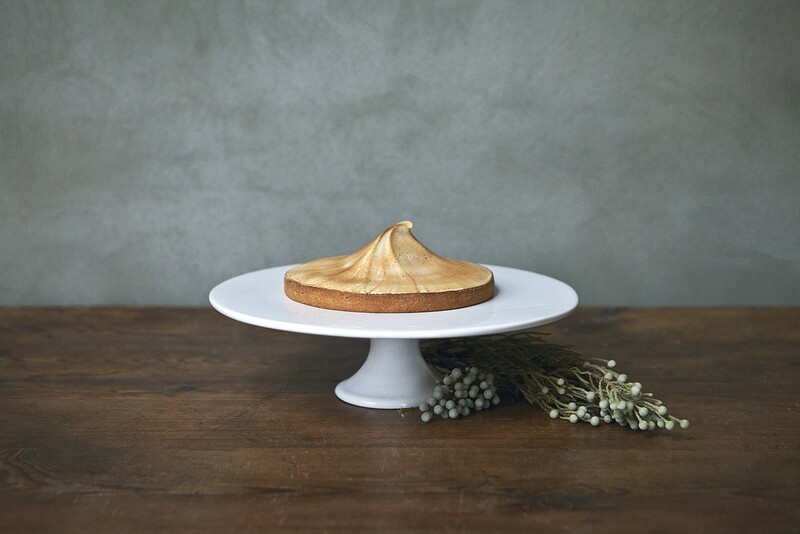 Doors open 14:00 – 17:00. 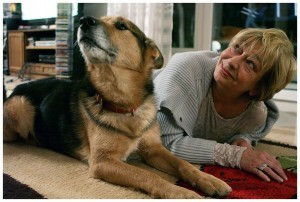 Julia Sokolnicka is a Polish experimental and documentary filmmaker. She’s an artist in residence in WOW Amsterdam and a graduating student of Artistic Research based Master of Film at NFA. Her film portfolio includes cooperations with choreographers, theatre and music video’s. 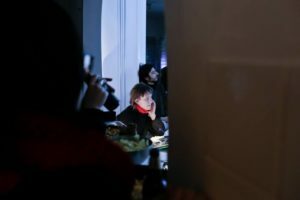 Coming from the post soviet country that has witnessed a rapid economic change in last 20 years, Julia Sokolnicka is researching how economy and politics put their mark into the landscape and how the landscape describes it’s inhabitants. 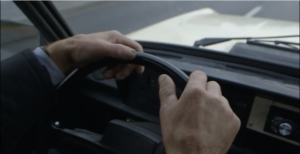 As a documentarian, Sokolnicka encounters people through conversation. 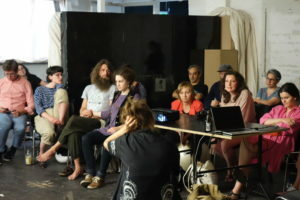 Method, conversation became a key figure in her work, turning the process of filming into a unique experience of cooperation. 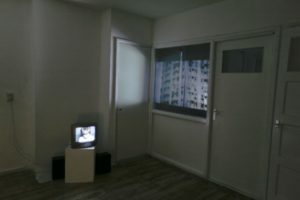 „Possibility of Film” is a film essay from walks on the Isle aux Moines in Bretagne she had with her tutors and friends about films she would want to make in the future. 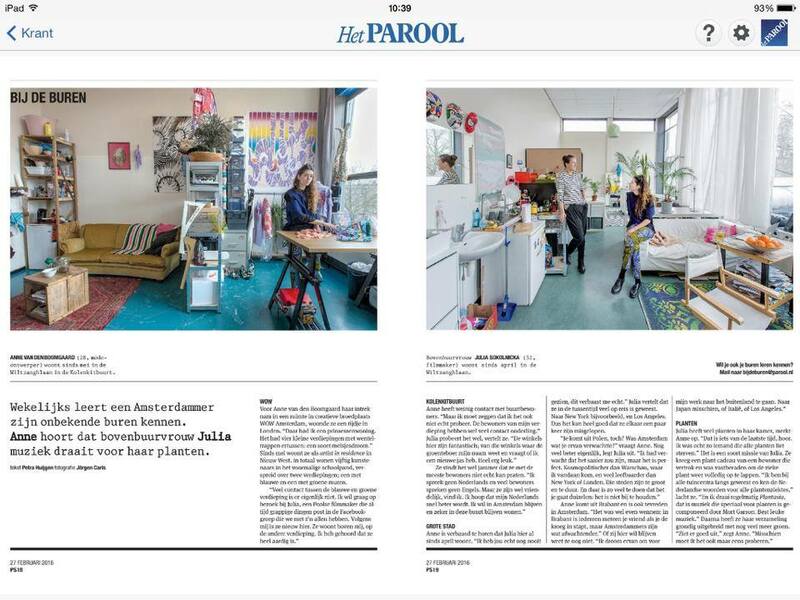 Amsterdam local newspaper Het Parol has interviewed me and a designer Anne van den Boogaart in their column „Neighbors meet neighbors”. Anne is a very talented designer and we lived in the same building for almost six months, but we never had a chance to meet. She uses batik and traditional design for her amazing pieces, she also works a lot with patterns and makes installations in space using her designs. We talked about life in big cities and music for plants. During WOW open Studio’s on March 12th I will be showing some of my latest works on social space and relation between humans and architecture. 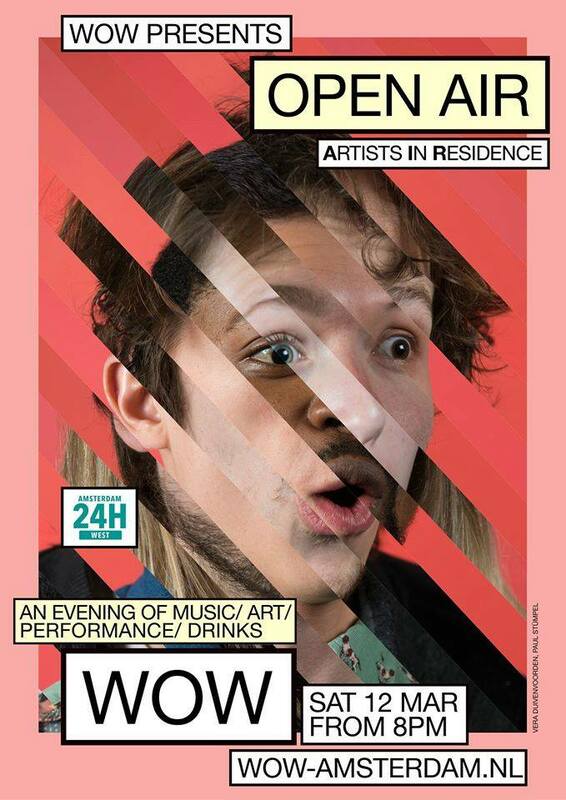 Since April 2015 I am an Artist in Residence in WOW Art Residency and Hostel in Amsterdam. 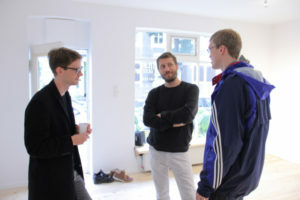 I was offered a gorgeous working space and curatorial supervision from a wonderful team of intelligent and visionary Amsterdamers, who try to combine Art spaces and business. It’s a good start in a new city and a source of friendships. Many great artists are AIR’s in WOW and I’m happy to be here. 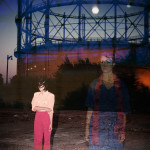 Here’s an interview with me about how does it feel to be in such institution. 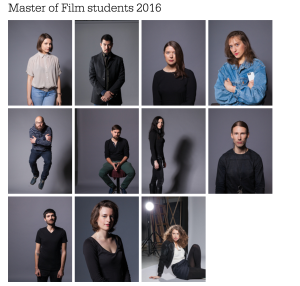 Polish emerging film director Julia Sokolnicka came to Amsterdam to attend the Master of Film at the Nederlandse Filmacademie and found in WOW the perfect combination with her studies. In front of a cup of tea Julia tells me it’s not the first time that she lives in an art community. Her previous experience in this kind of environment was in Gdańsk Shipyard, where she frequently visited some friends. 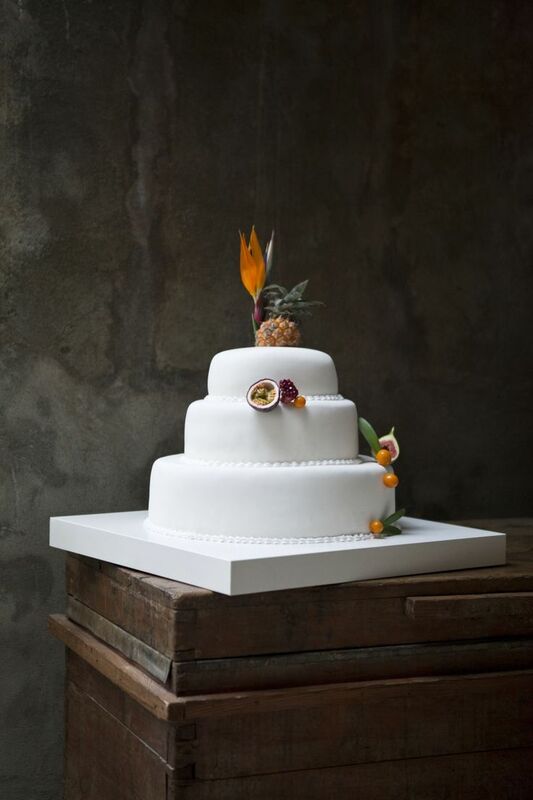 “It gave me an enormous benefit of collaboration, sharing of information, archive, interests. I would always come back with a head full of ideas, and I would always bring something”. When she came to Amsterdam she was looking for this kind of experience and she found a similar vibe in WOW. 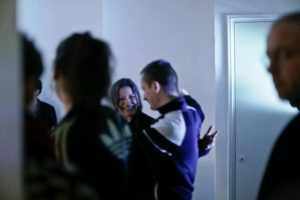 “It is a bit different to the community in Gdańsk, where it was self-organised and less institutionalised, and since we were in Poland and since everybody was broke anyway, we were freer to collaborate, and did not have much to lose. So if a job came it was done collectively”. 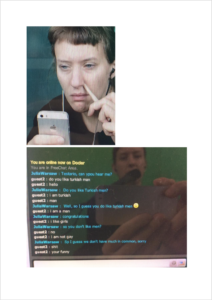 Even if in a completely different context she found in WOW a similar sense of collaboration and sharing. 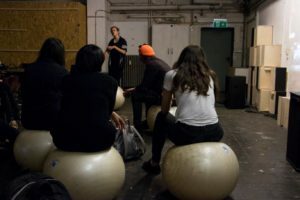 “Here you have a common space, meet people and ask for their opinion, and when you have artists around you, you know that you are talking to someone who understands, and even if they are from a different discipline it is really good to share”. And it is not only about sharing information and knowledge, but also about supporting each other. “We share not only the same interest, but also the same problems. It is helpful to be around people who understand the sacrifice, the lifestyle and the dynamics of it, because they can give you advice, and you care about each other.” This combination of being a student and in a residence is also helpful to focus. “I came here to make art, and this obliges me to work. These two years in my life it is the time when I’m really focusing on what I want to do and where do I want to go from where I am now”. Also her room is flexible and adapts to her work. After studying philosophy, she struggled to get into film schools in Poland, “I wasn’t thinking and I wasn’t doing the film that they wanted”, she explains. “At that time in Poland, if you wanted to make a documentary you needed to show an interesting person, and follow him or her. And this was not the way in which I was thinking about film making. 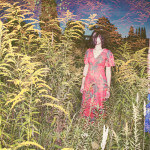 I was thinking about images and form, and what does the film do to you, also visually”. 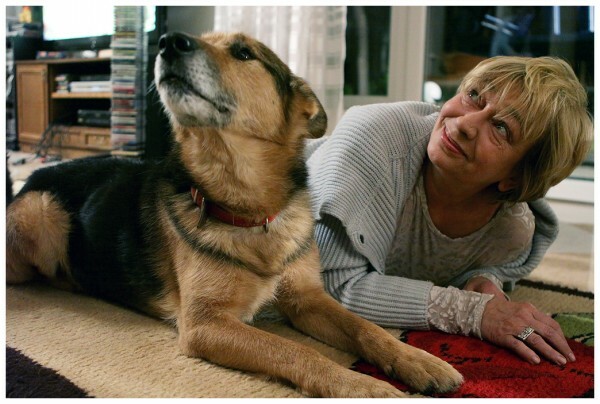 After some time working as a journalist, she found her way at the Wajda School, a film school founded by Andrzej Wajda and Wojciech Marczewski in 2001. 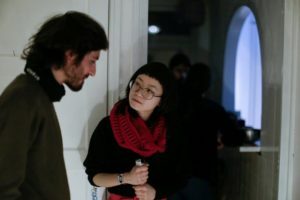 “They started courses for young film makers, that were not connected to the film scene and it went really to the core of film making”. However during film school the risk is to start being obsessed with skills, and “you start thinking that you cannot do anything without two millions euro, and if you are twenty-five and in film school, you should not think this way”. “That is why I started doing documentary, I just wanted to make film and did not think about money or other things”. This led her to a very stressful period, but also to the realisation that there is more than skills. “If you don’t lie down on your sofa, watch a movie, go to a party, meet someone interesting, go on vacation or to a gallery, read, you are never confronted with something new and you don’t learn”. The script doesn’t come out from the need of writing another funding application, but from ideas that come back and are constantly in your thoughts. 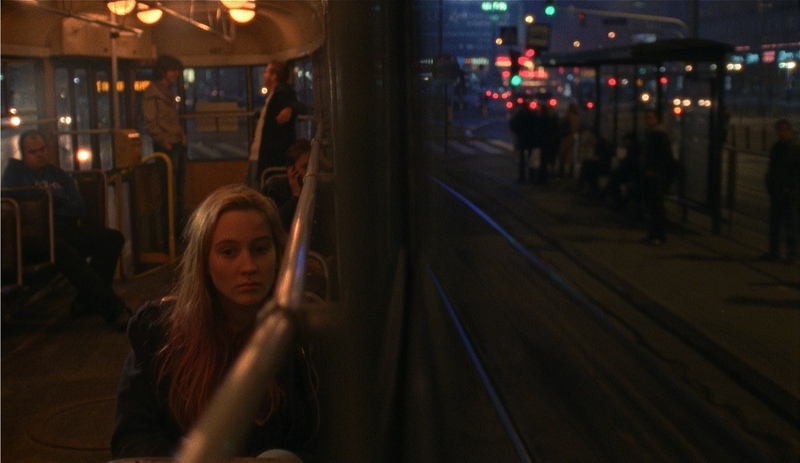 “If you want to be an artist who works with film as a medium you have to sit down and think, and also be bold and dare to do things and experiment and also fail. You don’t need expensive equipment, you can film something with your smartphone, then look back at it and be inspired and think how it could be done with a proper camera. Then you really work, when you conceptualise things, and think about what you want to say with your film”. However film making is more than skills and thinking, it takes also a lot of planning, flexibility, communication and time to find founding. 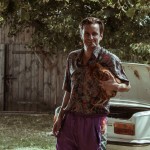 “Especially with film directing you need to be very precise and communicate well with people. When you start you need to ask people to do something for you for free, and you need to be very smart about it and be three steps ahead of people. And before you have a manager and a producer, sometime you need to do everything by yourself, and you learn by doing different things”. A variety that is also reflected in the many projects she worked on before coming to Amsterdam. When Julia was still studying philosophy she worked as a costume designer for commercials, then she made short documentaries for theatres and cultural institutions, and in the last five years she started collaborating with a Polish record label from Warsaw, Lado ABC. 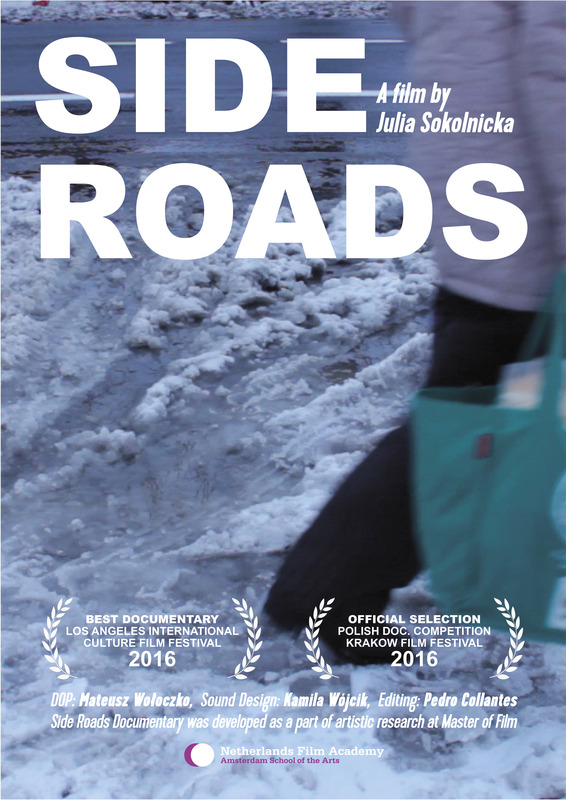 Julia just finished a documentary, Side Roads, about people driving in Poland during winter, and the landscape and architecture of these roads. Her intention was to capture the effect of the economic development of the past 20 years both on the people she rides with and on the landscape. “I try to focus on people who are not the young European style, so most of the people I talk to are older so they witnessed the change, but they are also regular people. 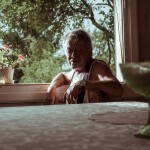 They talk about their work, and how they perceive life. I share the space with these people in their car, and listen to them talking, but at the same time I was free to look outside the window and look at the ugly but at the same time absurd, funny and rough Polish landscape”. 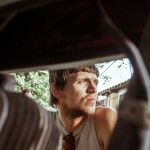 She juxtaposes the intimate portraits of the drivers with the peculiar architecture. 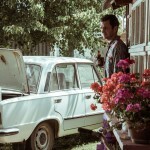 At the same time the film captures the Slavic character of Poland, the sadness of being on the road, and complaining but at the same time to be happy and positive about your life. 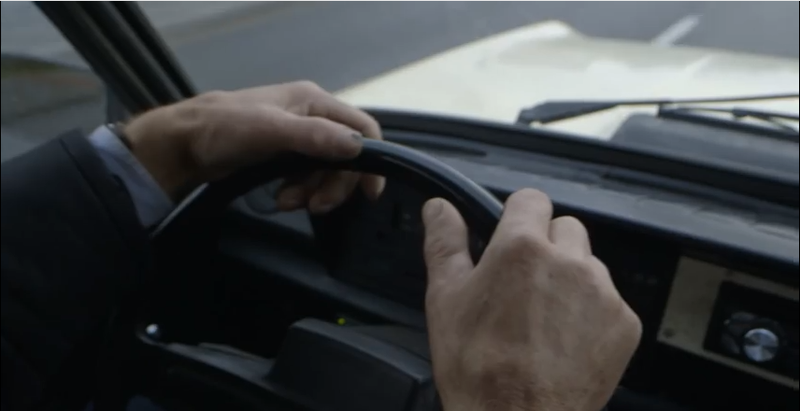 Julia wanted to capture something that is rapidly changing in Poland, and for three years she had many adventures hitchhiking around Poland in winter with a cinematographer, Mateusz Wołoczko. 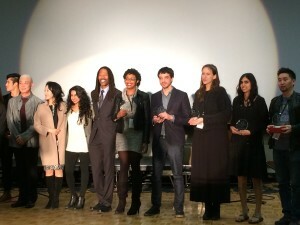 And now she will present the film during a film festival in Los Angeles next year. “It is super exciting because the film lives with you”, after Side Roads she is starting a new project, “a new child, I already know it will be with me for 3 or 4 years at least, and I’m really putting my whole heart into it. It is the results of experiences, notes that I took, dialogues that I overheard”. Using the possibilities given to her by her Master, but also her interest in learning new things, she is now focusing on script writing and fiction. Her main interest for her new project is the moment in which we demystify reality or someone discovers that things are not the way they thought. “I’m focusing on how you create yourself, and question if there is any reality at all if you can design it”. It won’t be classical storytelling anymore, but more of a philosophical riddle using actors. “There are different kind of realities and each person is a universe”. Take a look at some of Julia’s work on her website. I was attending to a seminar on Light and Architecture with AHK 2015 Artist in Residence Gabriel Lester. 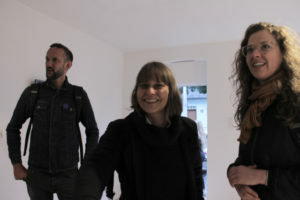 We worked with a wonderfull team of two architects and me uder the supervision of Uri Rapaport- an expert on Theatre, Opera and Exhibitions lightning, who has worked with the greatest artists in almost every European and world big scene available. The effect could be seen on an exhibition at Theatre Academy on 5th of July 2015. 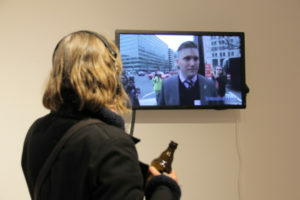 In Scenery reassembling the one shown on a film , a viewer could observe a looped video. 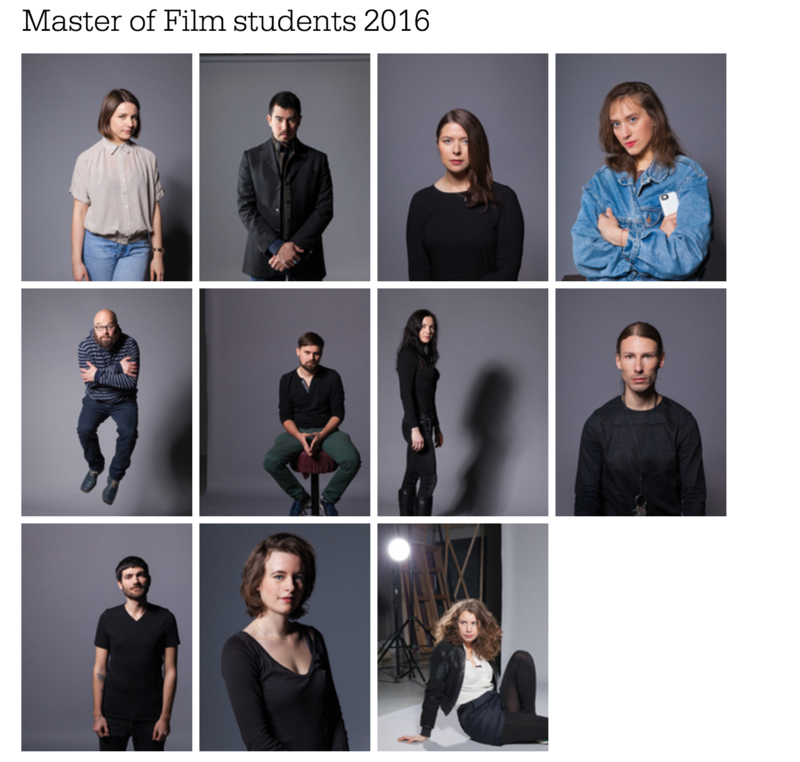 In September 2014 I started my studies at the experimental Master of Film studies in Nederlandse Filmacademie in Amsterdam. I am among 9 other people from all over the world, in a group 2016, which is the year of our graduation. 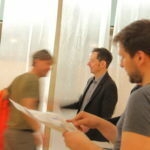 The course unites artists of different origins who wish to innovate the language of film. We are focusing on both intellectual research and experiments in the field of film. Our graduation projects , that will be presented in June 2016 in Amsterdam’s EYE Institute, are supposed to be based on the research we work on through the whole programe. My research „REALITY AND REALNESS. THE PATHS OF CREATIVE MIND” could be followed at my blog. I will , during those two years, finish my previous documentary works, coming from the idea of re – archiving, and also produce smaller pieces, tat could be considered experimental shorts that follow my research. I wish to end the course with at least one descent scenario that would reflect my research on reality and realness. HERE ARE SOME PHOTOSHOOTS, I HAVE CREATIVELY AND EXECUTIVELY PRODUCED IN MY COOPERATON WITH VINTAGE CLOTHING BRAND PROJEKT WZORCOWNIA. 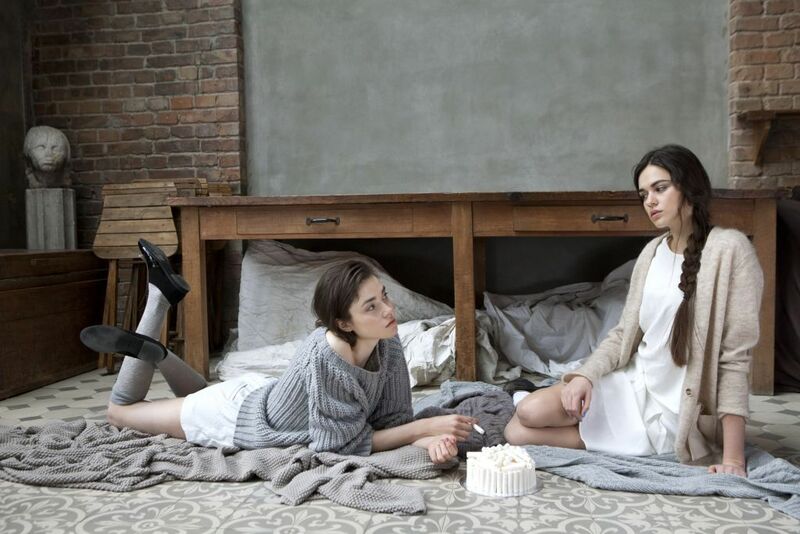 A story of Lena’s eighteenth birthday, a young woman who is trying to bond with her family. All Souls’ Day, a special time for contacting the dead and getting together to return to one’s roots, puts our protagonist in a special mood and changes her outlook on her own problems and her complicated situation. Julia was assistant costume designer for Shelagh Stephenson’s „Enlighment”. Julia była asystentką Ani Nykowskiej przy „Przebudzeniu” w tetrze Syrena, z Danutą Stenką i Wojciechem Malajatem w rolach głównych. Reżyseria Redbad Kljinstra. I styled some spots for the finals of TV programs including polish version of The Next Top Model, for polish TVN television. Check out some of the videos. Mamy z Małgorzatą Suwałą firmę!! We are Małgorzata Suwała and Julia Sokolnicka – a tandem of two artists, who specialise in scenography and costume design for creative projects. We are art directors who can design your production and take care of everything starting with creative process, and finishing with all the details, that you wouldn’t have to worry about any more. Zajmujemy się oprawą kostiumograficzno-scenograficzną teledysków i reklam, oraz stylizacją modową. 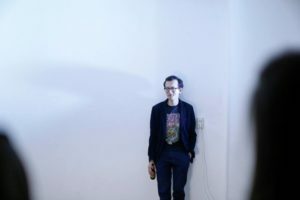 Jesteśmy art directorami specjalizującymi się w kreatywnych produkcjach. 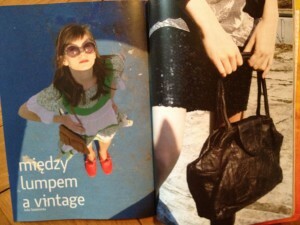 Dysponujemy własnym magazynem ubrań i dodatków, które zbieramy po całym świecie, po czym puszczamy w obieg, sprzedajemy, wypożyczamy do sesji i tworzymy z nich kostiumy filmowe. Jesteśmy otwarte na propozycje współpracy, najchętniej takie wymagające kreatywności. Można nas zatrudnić do całościowego projektowania strony wizualnej niewielkich projektów medialnych i średnio-budżetowych producji.